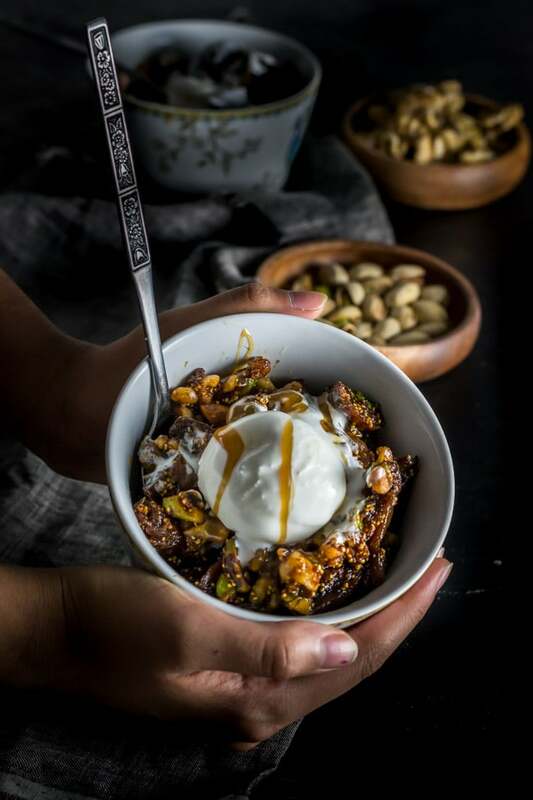 This Instant Pot fig and walnut halwa is perfect for when you need a quick and easy recipe to satisfy your sweet cravings. It is absolutely delicious and comes together in less than 30 minutes. There is always a sense of urgency when it comes to late-night desserts. It can’t take hours to make because slaving over the stove is the last thing we want to do so late in the day. Also, when you crave for a dessert you want it in your hands like right NOW.. almost like magic. That’s why this fig and walnut halwa fits the bill perfectly because it is not labor intensive – 5 minutes of pressure cooking along with 10 minutes of occasional stirring. The end result is this rich, buttery, gooey halwa that is the perfect answer to all your cravings. Serve this halwa with a scoop of vanilla ice cream to take it to the next level. 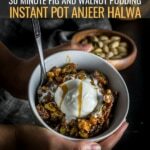 How to make fig and walnut halwa in Instant Pot? Dried figs are the star of the show. There are many varieties of figs but for this halwa, we will choose Turkish figs. They are smaller, plumper, moist and naturally sweet – that means you can skip adding sugar. This fig and walnut halwa or Anjeer halwa as they call it in India is traditionally made by steaming the figs and pureeing them. In this recipe, the figs are pressure cooked and mashed in the Instant Pot instead. Here are the step by step directions to make fig and walnut halwa. 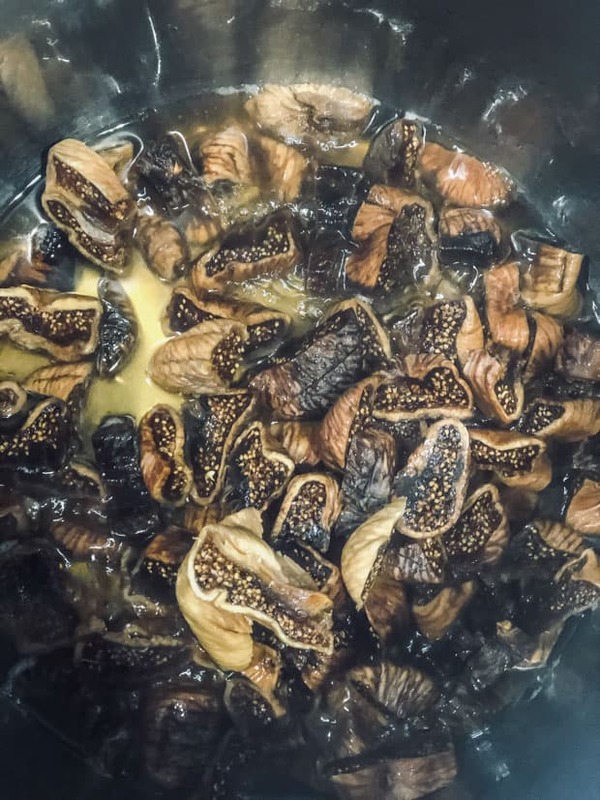 Combine the figs and water in the Instant Pot. Secure the lid and set the Pressure Release to Sealing. Select the Pressure Cook or Manual setting and set the cooking time for 5 minutes at high pressure. Perform a quick release by moving the Pressure Release to Venting. Open the pot and coarsely mash the figs with a potato masher or wooden spatula. Add the walnuts, pistachios, ghee, and cardamom and stir together. Press the Cancel button to reset the cooking program, then select the low Sauté setting and cook the halwa, stirring frequently, until it thickens to a pudding-like consistency, about 10 minutes. Press the Cancel button to turn off the Instant Pot. Spoon the halwa into bowls and serve. 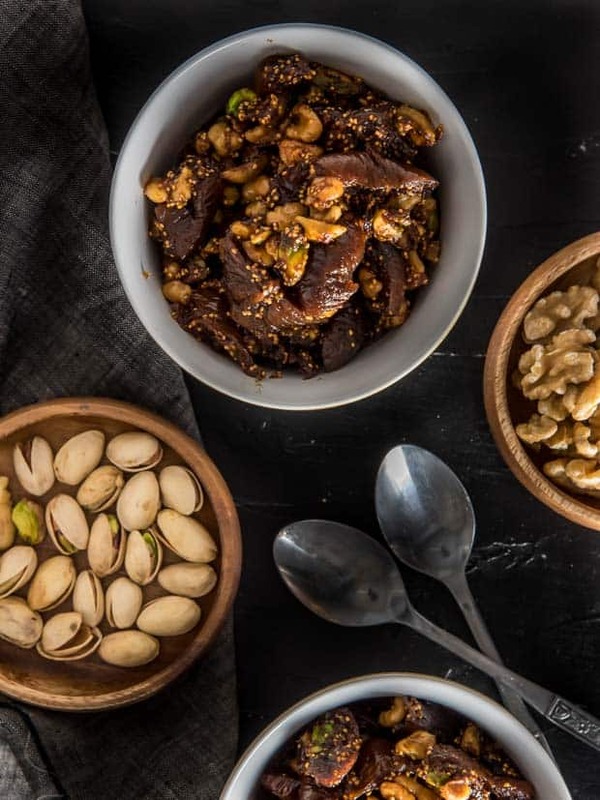 Before I jump to the recipe, I would like to share that this fig and walnut recipe is from Archana Mundhe’s book – The Essential Indian Instant Pot Cookbook and has been posted here with permission. Archana runs the popular blog – Ministry of curry and just like her blog, her book is a treasure trove of recipes and useful tips and has about 100 Indian food recipes that include both vegetarian and non-vegetarian fare. 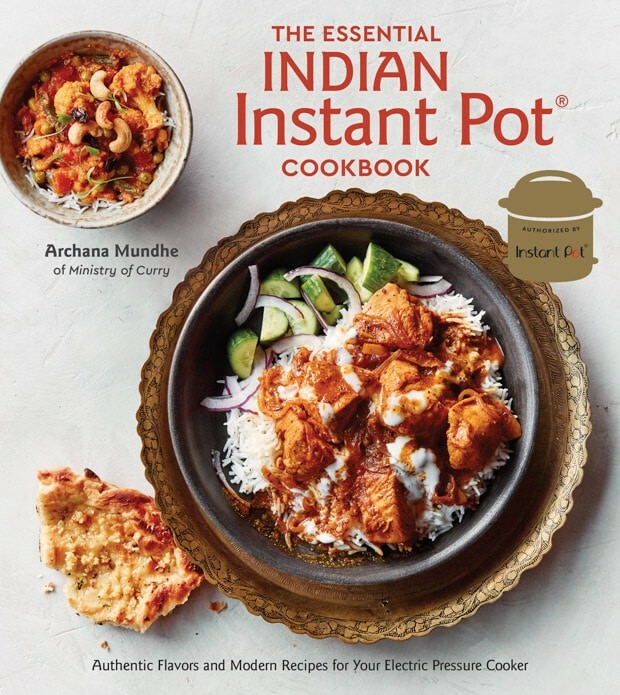 Archana’s book has everything you need to get started with Indian cooking in Instant Pot and I wish it was available when I first started with Instant Pot. You can get a copy of The Essential Indian Instant Pot Cookbook at Amazon or BarnesandNoble.com, Powells.com, IndieBound.org. 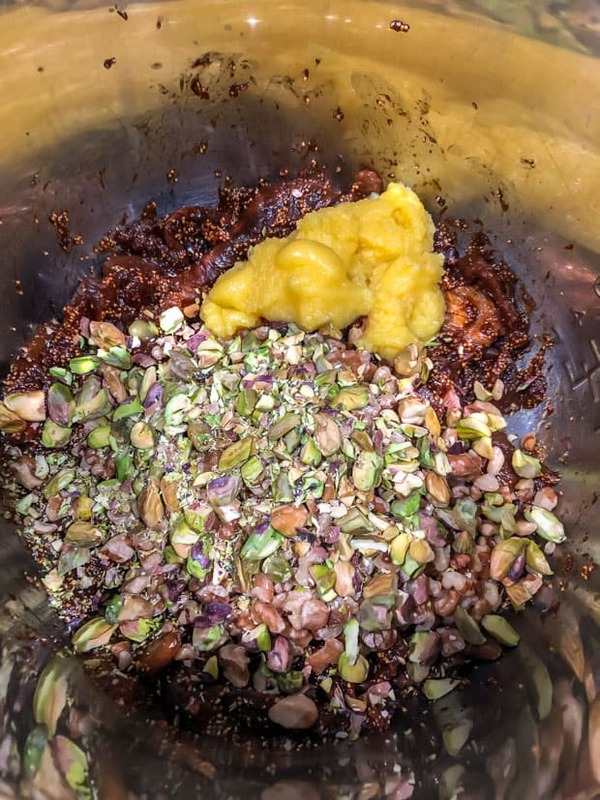 Recipe source – Reprinted with permission from The Essential Indian Instant Pot Cookbook, copyright 2018 by Archana Mundhe. Published by Ten Speed Press, an imprint of Penguin Random House LLC. 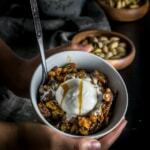 If you have a sweet tooth like me and enjoy having a dessert with your meals, here are a few other dessert recipes that you can make in your Instant Pot.